Final Kick is a penalty shootout game that will have you playing against the best of the best. 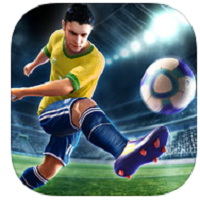 Developed by Ivanovich Games, it allows you to deliver stunning goals and make crucial saves. Final Kick also gives you the opportunity to use special effects, practice your shots and control with just one finger. There are a lot of football games available for download, but Final Kick stands out because of its very detailed graphics. The game also features several replay options so you can view your goal in various angles in all their detail. The amount of detail in the game is just one aspect though, as the controls are just as impressive. Simply put, Final Kick also has some very simplified controls. You just use your finger to shoot the ball. To save just drag the goalkeeper along, and that’s all there is to the controls. While learning them is easy, trying to master it is another matter and you’ll need to spend some time playing the game to do so. Final Kick also lets you go up against your friends or you can have the game search for someone you can play against. These are short games, less than two minutes, so if you’re looking for some quick action this will be a lot of fun. Final Kick also has a local offline tournament mode where you can go up against other teams minus an Internet connection. Final Kick also lets you customize your squad and train them. The level of customization actually goes down to the players’ details, so you can make a team truly your own.